Alpha decay is a type of radioactive decay in which an atomic nucleus emits an alpha particle. An alpha particle (or α particle, named after the first letter of the Greek alphabet) consists of two protons and two neutrons bound together. It is identical to the nucleus of a helium atom and may therefore be written as He2+ or 42He. Alpha decay is a form of nuclear fission in which the parent atom splits into two daughter products. When an atomic nucleus releases an alpha particle, the atom decays (is transformed) into another atom with a mass number that is lower by 4 and an atomic number that is lower by 2. For example, the alpha decay of radium atoms converts them to radon atoms, released as a gas. Also, most of the helium produced on Earth comes from the alpha decay of underground deposits of minerals containing uranium or thorium. The helium is brought to the surface as a by-product of natural gas production. Radioisotopes that emit alpha particles are used to provide safe power sources for certain types of generators in space probes and artificial heart pacemakers. The isotope americium-241 is an alpha-particle emitter and is used in some types of smoke detectors. Alpha radiation that is external to the body is generally not harmful because the particles are absorbed by a few centimeters of air or by the thin layer of dead cells on the skin. However, if an alpha-radiating substance enters the body by ingestion, inhalation, or other means, some of the body's internal tissues receive a high dose of ionizing radiation, causing significant damage. The second form is preferred because the first form appears electrically unbalanced. Fundamentally, the recoiling thorium nucleus is quickly stripped of two electrons that may neutralize the alpha particle (helium cation). Alternatively, alpha particles may extract electrons from atoms in their immediate environment, ionizing those atoms. In the classical view, an alpha particle does not have enough energy to escape from the nucleus. (It is said to be trapped in a "potential well," or energy minimum.) By 1928, George Gamow solved the mystery of alpha decay by the theory known as "quantum tunneling." Applying the principles of quantum mechanics, Gamow showed that an alpha particle has a tiny (but non-zero) probability of "tunneling" through the energy barrier and escaping from the nucleus. Unlike beta decay, alpha decay is governed by the strong nuclear force, which holds protons and neutrons together. Emission of an alpha particle sometimes leaves the atomic nucleus in an excited (higher energy) state. To remove the excess energy, the nucleus may emit a gamma ray. Alpha particles are a highly ionizing form of particle radiation, but they have low penetration. They are easily stopped by a sheet of paper. An alpha particle is deflected by a magnetic field. Alpha radiation consists of helium-4 nuclei and is readily stopped by a sheet of paper. Beta radiation, consisting of electrons, is halted by an aluminum plate. Gamma radiation is eventually absorbed as it penetrates a dense material. The alpha particle mass is 6.644656×10-27 kg, which is equivalent to the energy of 3.72738 GeV. The charge of an alpha particle is equal to +2e, where e is the magnitude of charge on an electron. The kinetic energy of alpha particles varies, with higher energy particles being emitted from larger nuclei. Most alpha particles have kinetic energies in the range of 3 to 7 MeV, which is a substantial amount of energy for a single particle. However, their high mass means alpha particles have a lower speed (with a typical kinetic energy of 5 MeV the speed is 15,000 km/s) than any other common type of radiation (such as β particles, γ rays, or neutrons). Alpha particles have a typical kinetic energy of 5 MeV (that is ≈0.13 percent of their total energy, i.e. 110 TJ/kg) and a speed of 15,000 km/s. This corresponds to a speed of around 0.05 c, where c is the speed of light in a vacuum. Because of their relatively large mass, +2 charge, and relatively low velocity, they are very likely to interact with other atoms and lose their energy, so they are effectively absorbed within a few centimeters of air. Because of their charge and large mass, alpha particles are easily absorbed by materials and can travel only a few centimeters in air. They can be absorbed by tissue paper or the outer layers of human skin (about 40 micrometers, equivalent to a few cells deep) and so are not generally dangerous to life unless the source is ingested or inhaled. Because of this high mass and strong absorption, however, if alpha radiation does enter the body (most often because radioactive material has been inhaled or ingested), it is the most destructive form of ionizing radiation. It is the most strongly ionizing, and with large enough doses can cause any or all of the symptoms of radiation poisoning. It is estimated that chromosome damage from alpha particles is about 100 times greater than that caused by an equivalent amount of other radiation. The alpha emitter polonium-210 is suspected of playing a role in lung and bladder cancer related to tobacco smoking. Because alpha particles occur naturally, but can have energy high enough to participate in a nuclear reaction, study of them led to much early knowledge of nuclear physics. The physicist Ernest Rutherford famously used alpha particles to infer that J. J. Thomson's Plum pudding model of the atom was fundamentally flawed. Rutherford's famous gold foil experiment was conducted by his students Hans Geiger and Ernest Marsden. A narrow beam of alpha particles was set up, passing through very thin (only a few hundred atoms thick) gold foil. The alpha particles were detected by a zinc sulfide screen, which emits a flash of light upon an alpha particle collision. 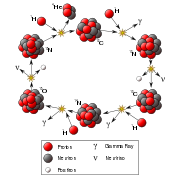 Rutherford hypothesized that, assuming the "plum pudding" model of the atom was correct, the positively charged alpha particles would be only slightly deflected, if at all, by the dispersed positive charge predicted. It was found that some of the alpha particles were deflected at much larger angles than expected, with some even bouncing back. Although most of the alpha particles went straight through as expected, Rutherford commented that the few particles that were deflected was akin to shooting a fifteen inch shell at tissue paper only to have it bounce off, again assuming the "plum pudding" theory was correct. 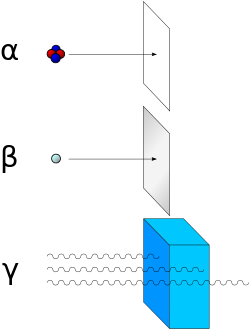 It was soon determined that the positive charge of the atom was concentrated in a small area in the center of the atom, hence making the positive charge dense enough to deflect any positively charged alpha particles that happened to come close to what was later termed the nucleus (it was not known at the time that alpha particles were themselves nuclei, nor was the existence of protons or neutrons known). Rutherford's experiment subsequently led to the Bohr model and later the modern wave-mechanical model of the atom. In computer technology in 1978, "soft errors" were traced to alpha particles in Intel's DRAM (dynamic random access memory) chips. The discovery led to strict control of radioactive elements in the packaging of semiconductor materials, and the problem was largely considered "solved." The isotope americium-241 emits alpha particles, and this property is used in some types of smoke detectors. The alpha particles ionize molecules in the air within a narrow gap, producing a small current. This current can be easily interrupted by smoke particles. Generally, external alpha radiation is not harmful because alpha particles are completely absorbed by a few centimeters of air. Even touching an alpha source is usually not harmful; the thin layer of dead cells on the skin will absorb them. However, if a substance radiating alpha particles is somehow introduced into an organism (such as by ingestion, inhalation, injection, or shrapnel penetration), some of the organism's tissue becomes exposed to a high dose of ionizing radiation. In such cases, the alpha radiation causes significant damage to the cells. Radon is a naturally occurring, radioactive gas found in soil, rock, and sometimes groundwater. When radon gas is inhaled, some of the radon particles stick to the inner lining of the lung. The particles that remain continue to decay over time, emitting alpha particles which may damage cells in the lung tissue. As noted above, certain types of smoke detectors contain a small amount of the alpha emitter americium-241. This isotope is extremely dangerous if inhaled or ingested, but the danger is minimal if the source is kept sealed. Many municipalities have established programs to collect and dispose of old smoke detectors, rather than let them go into the general waste stream. Marie Curie's death from leukemia at age 66, was likely caused by prolonged exposure to high doses of ionizing radiation. Curie worked extensively with radium, which decays into radon, along with other radioactive materials that emit beta and gamma rays. The 2006 assassination of Russian dissident Alexander Litvinenko is thought to have been caused by poisoning with polonium-210, an alpha emitter. ↑ U.S. Environmental Protection Agency, Radionuclides (including Radon, Radium and Uranium). Retrieved October 23, 2007. ↑ Health Physics Society, Did Marie Curie die of a radiation overexposure? Retrieved October 23, 2007. This page was last modified on 8 March 2019, at 17:13.